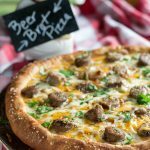 Beer Cheese Brat Pretzel Pizza - What the Forks for Dinner? Here at What the Forks for Dinner? we are all about pizza! 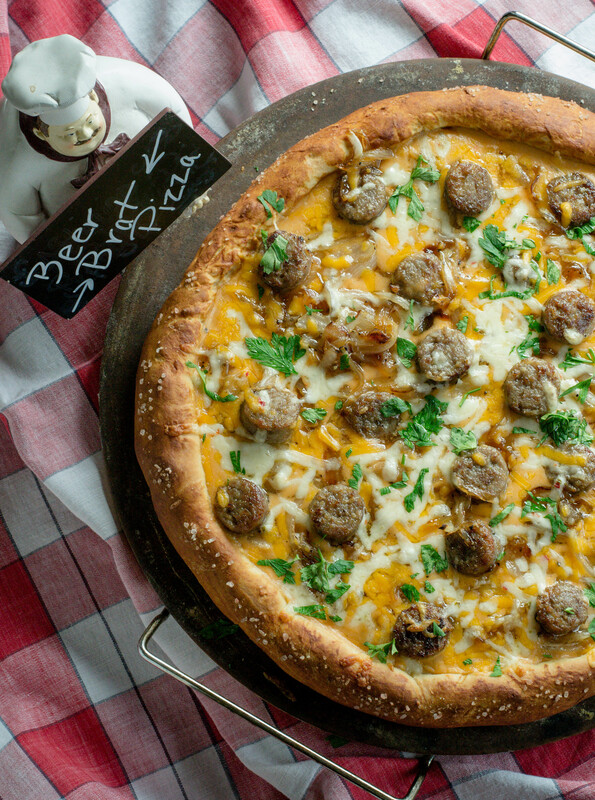 Beer Cheese Brat Pretzel Pizza is our latest labor of love of pizza! It’s football season*…Sundays in front of the TV and food! 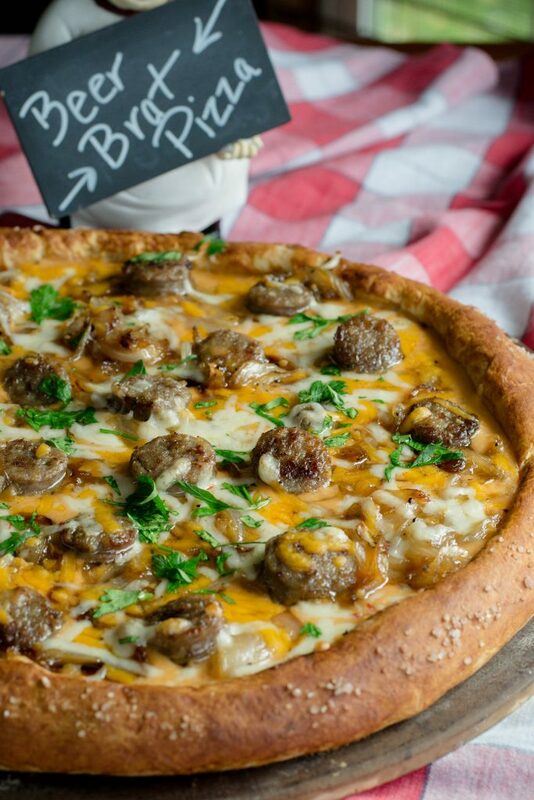 Brats, dips, pretzels…….. how convenient….we made a pizza with all those things. *Side note: I originally wrote this post during football season, and was sure I posted it…..oops……I did not…..blogger brain? Anyway the recipe was tooo delicious to not share!! I will be the first to admit, that this is a bit labor intensive, but the end result is totally worth it. It has quite a few elements. All of them can be made ahead, so on game day you can just assemble and bake. I used our Auntie Anne’s Pretzels Copycat Recipe for the pizza crust. If you are not comfortable making crust or you want to make this last minute, a pre-made pizza crust will work. Not quite pretzely, but it will work all the same. Besides, the star of the pizza really, is the beer cheese. This stuff is beyond delicious, and super easy. I mean totally easy!!! A bottle of beer, shredded cheese, cream cheese, and a jalapeño…..done! You could use this for Beer cheese dip also. Caramelized onions and brats are a match made in beer cheese heaven. Once again easy to prepare and make ahead. Par-baking the crust if you are using the dough recipe is a must. The first go round of Beer Cheese Brat Pretzel Pizza I did not par-bake the crust, while still delicious the crust was soggy. Pretzel crust is soft to begin with, and adding the cheese without par-baking.. not so very good! Once the crust is par-baked, slather on the beer cheese, and top with the brats and onions. An extra helping of cheese on top and back into the oven. Be sure to watch he pizza as the crust can get a little too brown quickly. 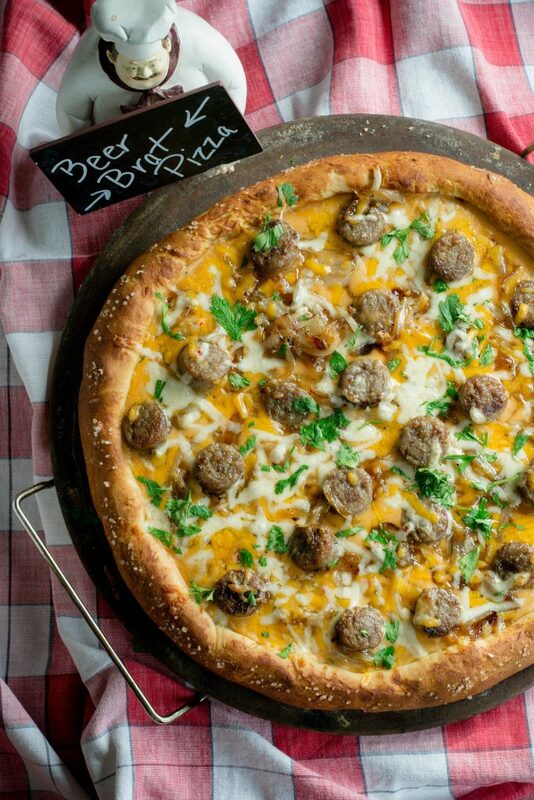 For football Sunday or anytime you want a beer cheesy treat try our Beer Cheese Brat Pretzel Pizza! 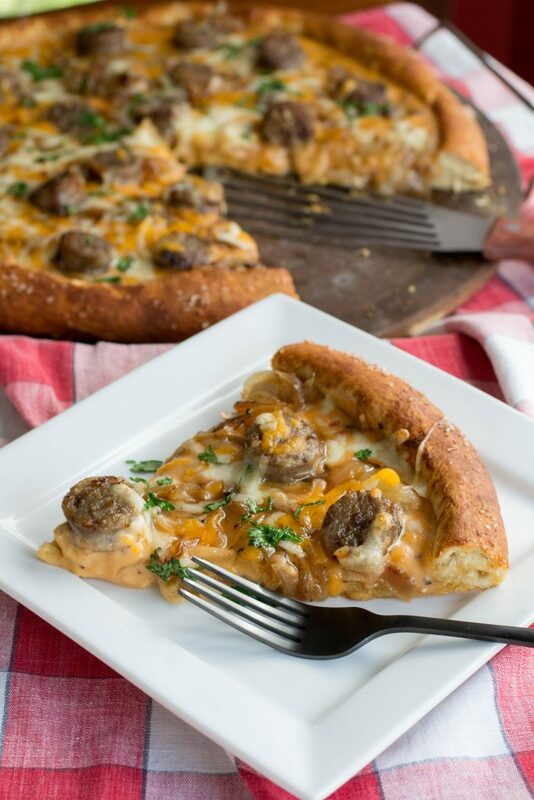 Pretzel crust pizza topped with beer cheese, brats and caramelized onions. Great game day pizza! Prepare pretzel dough. While the dough is rising prepare the beer cheese, caramelized onions and cook the brats slicing them. Divide the pretzel dough in half. On a lightly floured board press and roll the dough into a 12 inch circle. Place the dough on a pizza stone or cookie sheet. Using a fork poke holes all over the pizza crust. In a small bowl mix 1 tablespoon of baking soda with 2 tablespoons water. Using a brush, wash the pizza crust with the baking soda mixture. Do not use all of the mixture just enough to dampen the crust. Sprinkle the edges of the pizza with salt. Place in oven and bake the crust for 12-15 minutes until golden brown. Remove crust from oven and spread half of the beer cheese on the baked crust. Top with brats, caramelized onions, and remaining shredded cheese. Return to the oven and bake for an additional 7-8 minutes, until the cheese is melted. In a medium bowl mix flour, salt & pepper, with the cheddar and jack cheese. Add the cheese mixture a handful at a time, stirring until cheese is melted. Once all of the cheese is melted add the cream cheese, mustard, Worcestershire, and jalapeño. Continue stirring until the cream cheese is melted. If the sauce is too thick use remaining beer to thin. Warm up the milk in the microwave or on the stove for just about one and a half minutes. It should be about 110º. If it’s too hot it will kill the yeast. You should be able to comfortably keep your finger in it. Stir in the yeast and let it sit for about 3 minutes. Add the butter and sugar. Add the flour about 1 cup at a time and the add the fine salt. Knead for about 10 minutes with a stand mixer, or by hand. Put it in a greased bowl and cover with greased cling wrap. Let rise for 1 hour in a moist, warm place until doubled in size. Preheat the oven to 450º. Punch down dough and divide. In a skillet, melt butter. Add the onions and sugar. Cook onions over medium low heat until golden brown and caramelized, stirring occasionally. Keep the heat closer to low or the onions will burn.